The statement offered the first glimpse of a showdown the roughly 400 migrants had been preparing for with the Trump administration. Members of a migrant caravan seeking asylum in the United States reached Tijuana, Mexico, on Sunday, where U.S. immigration officials said that the port of entry had filled to capacity and that people without documentation may have to wait south of the border. "As sufficient space and resources become available, CBP officers will be able to take additional individuals into the port for processing," Customs and Border Protection Commissioner Kevin McAleenan said. The statement offered the first glimpse of a showdown that the 150 or so migrants had been preparing for with the Trump administration. Earlier, the migrants gathered at a wall in Tijuana for an emotional meeting with a few hundred supporters in San Diego's Friendship Park. The two groups couldn't come entirely face to face, but thet chanted back and forth to one another, separated by about 100 feet. "We are immigrants. We are not criminals," some of the migrants chanted. "We are the hope of Latin America." Some climbed the fence, straddling the border to get a look at their supporters in the United States. On the California side, demonstrators chanted: "We are all Latin American. Together, we are the dream of the future." Many held signs, and a kite reading "refugees welcome here" was flown over the border. 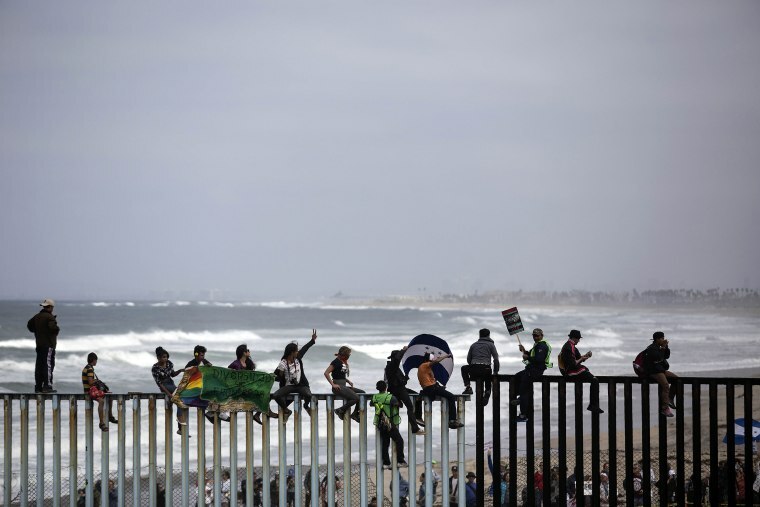 At one point, four couples traveling with the caravan paused in Tijuana for a brief marriage ceremony officiated by Emma Lozano, of Chicago’s Lincoln United Methodist Church, NBC San Diego reported. Video from the ceremony showed young couples clutching bouquets of flowers and exchanging rings as camera shutters clicked and the crowd whooped and clapped. Migrants travel 3,000 miles to reach the U.S.
Nicole Ramos, a human rights lawyer with the nonprofit Al Otro Lado, told NBC News that lawyers were helping families seeking asylum with the final preparations. Then the group plans to walk together to the point of entry, where the "families will present themselves to U.S. authorities." Ramos said the lawyers have prepared strong cases for 115 to 185 people, a large majority of whom are children. "The reason why the legal review is important is [so that] people who do not have a well-articulated asylum claim and no chance of winning do not needlessly subject themselves to a system that is designed to deport them — not protect them, deport them," she said. The Trump administration has described the group as a threat, and Attorney General Jeff Sessions called the caravan as "a deliberate attempt to undermine our laws and overwhelm our system." Nearly 20 lawyers from the United States were in the border city dispensing advice as a healthy slice of the nearly 400 people who ventured north through Mexico from Central America planned to ask for asylum on Sunday, according to Pueblo Sin Fronteras' Gina Garibo, who has been helping to guide the caravan. The lawyers were warning asylum seekers to expect the worst, including possible separation from children and family members and months of detention as their cases are weighed. "We are the bearers of horrible news," Los Angeles lawyer Nora Phillips said. "That's what good attorneys are for." Earlier this month, President Donald Trump tweeted that the caravan "better be stopped before it gets there" to the border. He blamed Congress for what he described as "weak" immigration laws that encourage such migration. The official stance of the U.S. Department of Homeland Security is that the asylum seekers, who began their trek March 25 near the Guatemalan border, should have tried to settle in Mexico. But Homeland Security Secretary Kirstjen Nielsen said their claims at the U.S.-Mexico border would be expedited "efficiently and expeditiously." At the same time, she warned that anyone who helps an undocumented immigrant make false claims of asylum could be prosecuted. Who's Pueblo Sin Fronteras, the group behind the migrant caravan that drew Trump's ire? The trek south of the border was much more dangerous and taxing. A migrant who gave her name as Katerine sat in Tijuana with her baby girl, Ashley, on her lap. She told NBC News that she wants to get to North Carolina. She said the pair went days without food and water and used the infamous freight train known as "the beast" to get part of the way through Mexico. "We've had exactly a month without sleeping in a bed," she said. Associated Press, Gadi Schwartz and Tim Stelloh contributed.